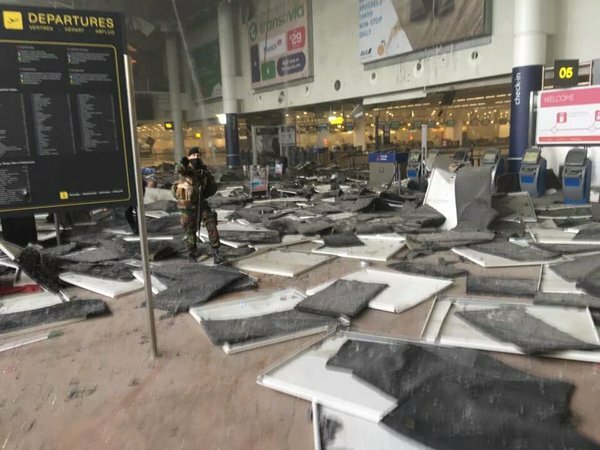 Islamic State have allegedly claimed responsibility for explosions at Zaventem international airport Brussels shortly before 8am and a further blast at Maalbeek metro station soon after which left at least 34 dead and nearly 200 injured. 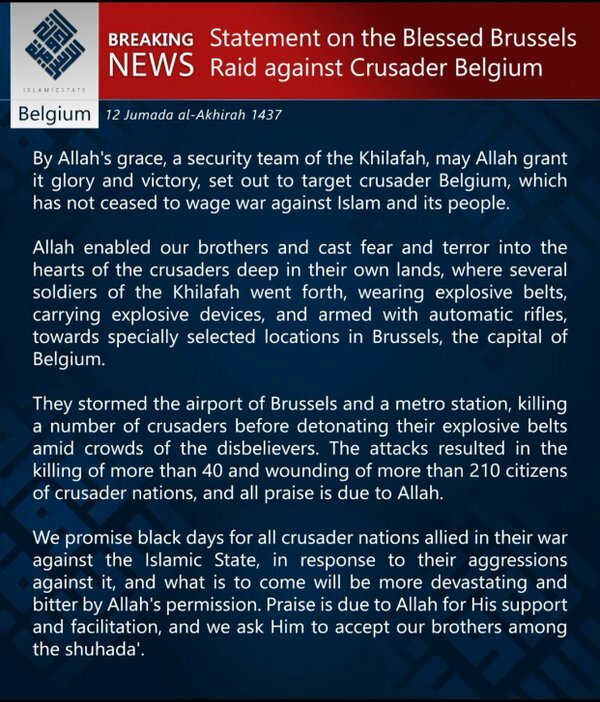 Brussels – Amaq Agency: Islamic State fighters carried out a series of bombings with explosive belts and devices on Tuesday, targeting an airport and a central metro station in the center of the Belgian capital Brussels, a country participating in the international coalition against the Islamic State. 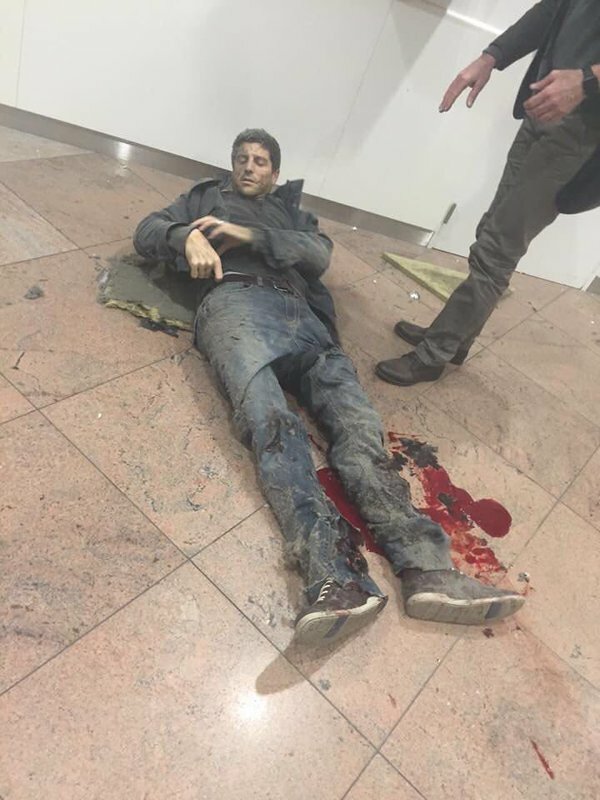 Islamic State fighters opened fire inside Zaventem Airport, before several of them detonated their explosive belts, as a martyrdom bomber detonated his explosive belt in the Maalbeek metro station. 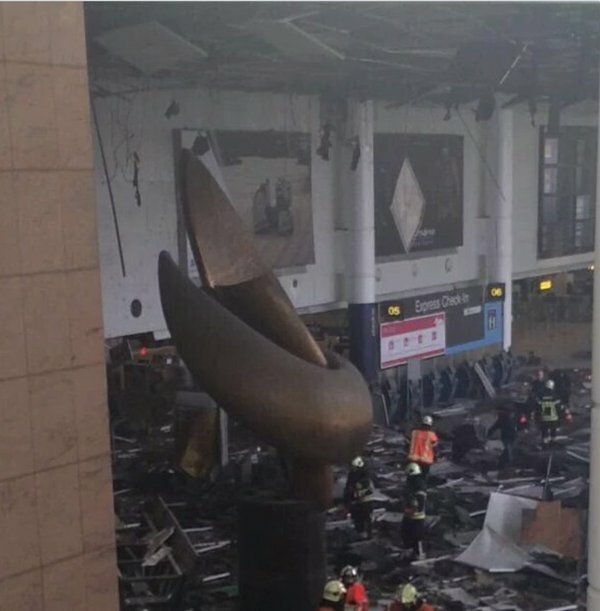 The attacks resulted in more than 230 dead and wounded. 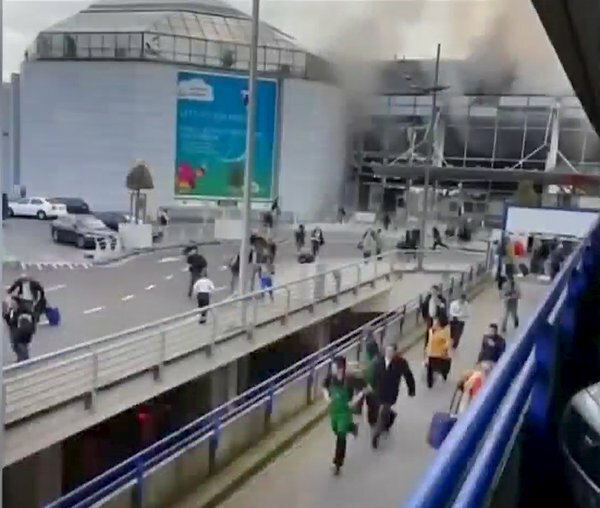 Belgium media initially put out an unconfirmed report that a “suicide attack” shook the airport building located 7 miles from the city which handles around 23 million passengers a year according to the BBC. 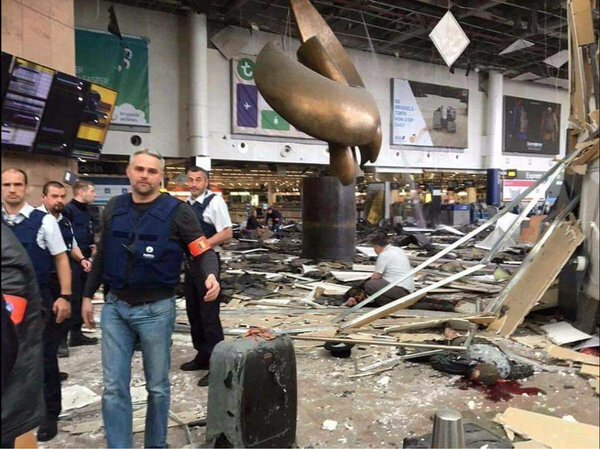 Telegraph stated, “Eyewitnesses said the first blast took place at an excess baggage payment order, and the other near to a Starbucks cafe.” The attacks claimed 20 lives on the metro and 14 at the airport. A third device did not go off and was detonated by controlled explosion. Footage emerged of passengers cowering in shock behind their luggage not knowing if more explosions would follow, others travellers could be seen fleeing in terror. Dazed passengers were guided on to the tarmac by airport staff and were later removed to a nearby crisis centre by a fleet of buses. 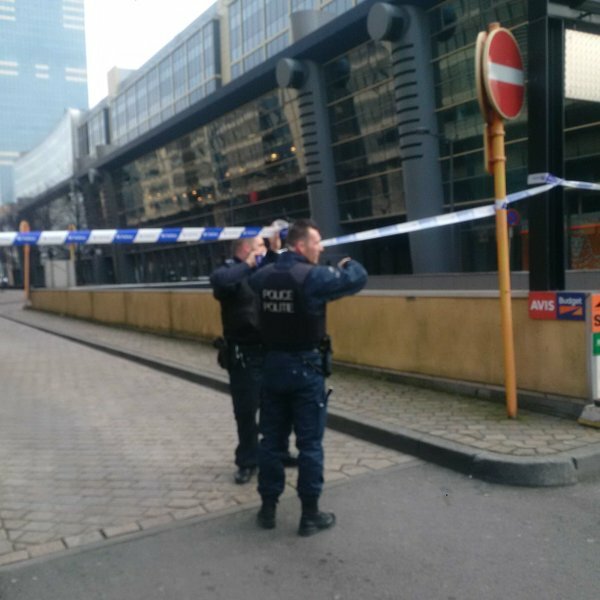 Brussels is now in lockdown. Flights have been cancelled or diverted to other airports with instructions put out by authorities not to come to the airport. Trains in the vicinity have also been stopped. 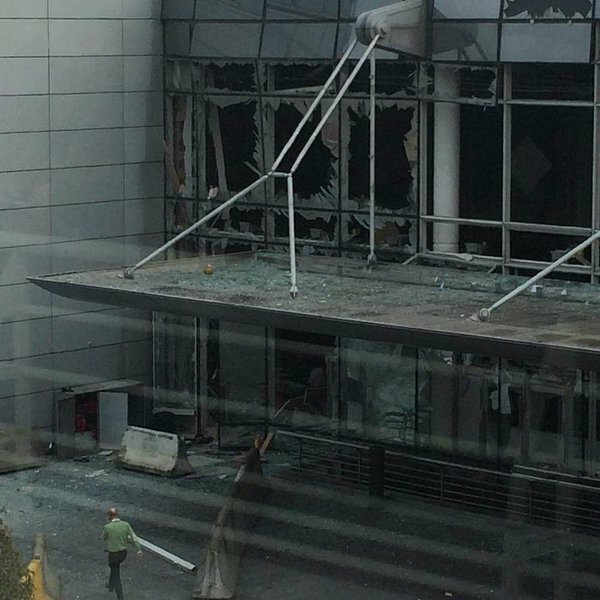 Sky News reported that shots were fired and shouting heard in Arabic (unconfirmed) before a blast near to an American Airlines in the Departure hall. A Kalashnikov weapon was found next to the body of an alleged attacker. 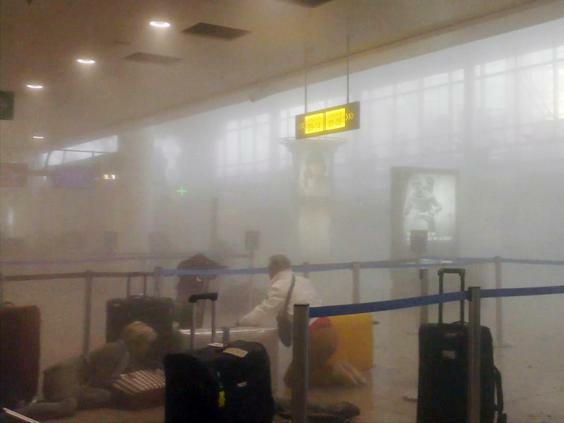 Smoke could be seen rising from an airport, photographs taken inside revealed a scene of devastation, broken plate glass windows and the floor covered in ceiling tiles, bodies and blood. On the Metro between Schuman and Maelbeek. We have just been stopped due to an “incident on the line”. Can hear soft thudding in distance. We felt a blast of air and my ears popped shortly after leaving Schuman station. 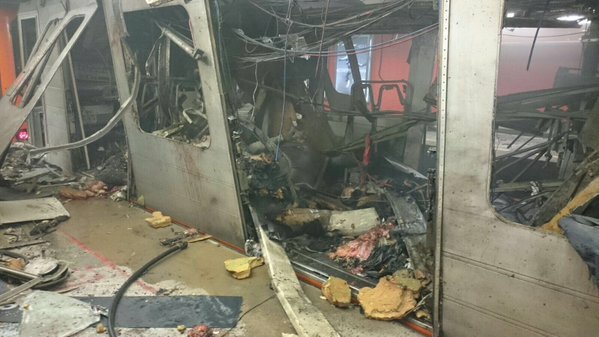 The Metro stopped immediately. 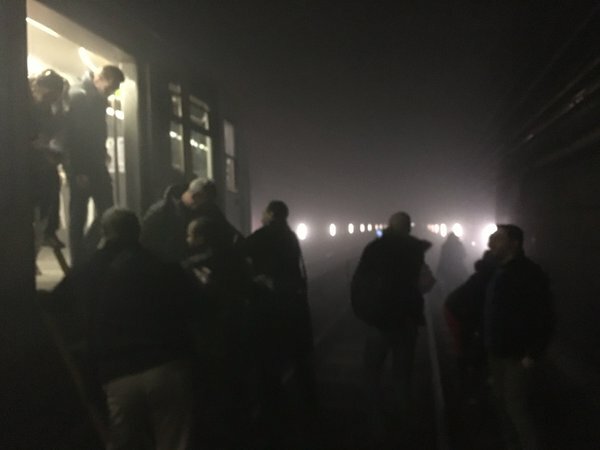 We are being evacuated from the back of the Metro, between Schuman and Maelbeek. Smoke in the tunnel as we evacuate. Just arrived at Schuman station after walking on the tracks. 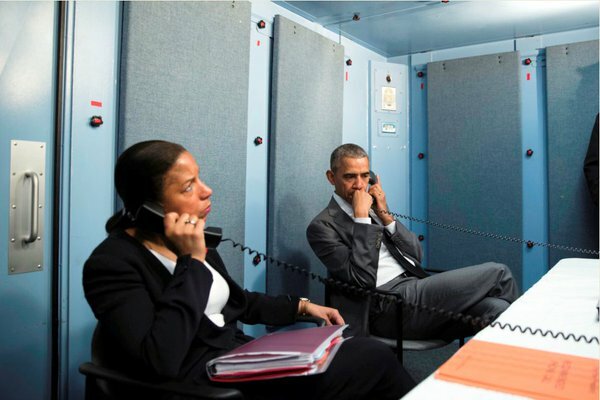 WH releases photo of Obama & @AmbassadorRice being briefed on #BrusselsAttacks inside secure room in #Havana, #Cuba. PM: The terrorists behind today’s atrocities attack our way of life and they attack us because of who we are. We will never let them win. 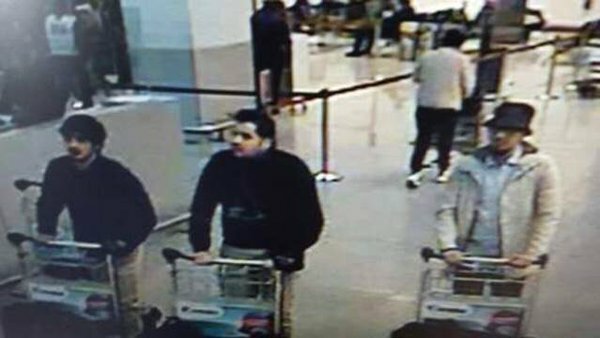 The Foreign Office has advised against all but essential travel to Brussels. “Excuse me but there are 10 of children getting killed in yemen everyf……day. Where is the media and the human outrage? Why is it only when someone dies in Europe everyone Starts speaking up? This is not Islam. Islam prohibits the killing of innocent people regardless of your colour creed or religious beliefs. Those who commit such atrocious acts in the name of Islam are not Muslims they are terrorists using Islam as their front to cause mayhem&disruption all around. Terrorism has no Religion. Thanks for your comment. All civilian life must be protected. I have just finished writing on Coalition airstrikes on Mosul University, Iraq, during the day, yet barely reported. Can you imagine how many civilians affected in such a huge complex…. I salute You from my heart. Wonderful reply by You. Unfortunately, people don’t see both sides of he coin. Let me tell such people that why don’t you see the scale of arial bombing on Iraq & Syria where hundreds die each day. Remember O’ people, “No justice, No peace”. Thanks. Keep it up Madam Carol Anne. Thanks for your comment. Sadly only some lives seem to matter in this world. As long as such double standards exist so too will violent responses…. that is the grim reality!